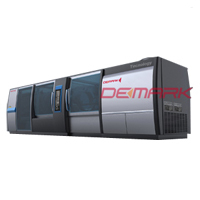 48 Cavity PET Preform Injection Molding Systems,Two Screw,Rebot+Cooling,9S (DMK-PET48A) - Demark Blow Molding Machine & PET Preform Mould Co., Ltd.
2. Optimized cycle utilization — being mounted on the moving platen, the cooling system remains active for up to 85% of the overall cycle. 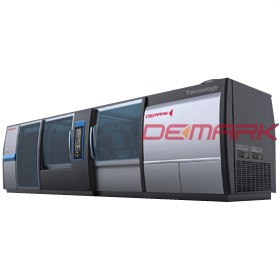 Demark pet preform injection molding systems are available from 280 to 500 tonnes (2800 to 5000 kN) and up to 72 cavities. Reflex platens distribute clamp force evenly across the platen face. demark systems offer both reciprocating screw (RS) and two-stage injection units. RS units offer the performance required for many PET applications while two-stage is appropriate for higher throughput applications. Linear bearings support the moving platen directly on the machine base. This design reduces mold wear by improving platen alignment and perpendicularity, and provides a grease free molding environment.